One of the ongoing mysteries that all Windows Vista users experience at one time or another is what might be called the “now-you-see-it-now-you-don’t” problem. This is a glitch that plagues you for a while and then mysteriously vanishes without any intervention on your part. (This also tends to occur when you ask a nearby user or someone from the IT department to look at the problem. Like the automotive problem that goes away when you take the car to a mechanic, computer problems will often resolve themselves as soon as a knowledgeable user sits down at the keyboard.) When this happens, most people just shake their heads and resume working, grateful to no longer have to deal with the problem. Unfortunately, most computer ills aren’t resolved so easily. For these more intractable problems, your first order of business is to track down the source of the glitch. This is, at best, a black art, but it can be done if you take a systematic approach. Over the years, I’ve found that the best approach is to ask a series of questions designed to gather the required information and/or to narrow down what might be the culprit. The next few sections take you through these questions. Unfortunately, most computer error messages are obscure and do little to help you resolve a problem directly. However, error codes and error text can help you down the road, either by giving you something to search for in an online database or by providing information to a tech support person. Therefore, you should always write down the full text of any error message that appears. If the error message is lengthy and you can still use other programs on your computer, don’t bother writing down the full message. Instead, while the message is displayed, press Print Screen to place an image of the current screen on the clipboard. Then open Paint or some other graphics program, paste the screen into a new image, and save the image. If you think you’ll be sending the image via email to a tech support employee or someone else that can help with the problem, consider saving the image as a monochrome or 16-color bitmap or, if possible, a JPEG file, to keep the image size small. If the error message appears before Windows Vista starts, but you don’t have time to write it down, press the Pause Break key to pause the startup. After you record the error, press Ctrl+Pause Break to resume the startup. Open the Event Viewer and examine the Application and System logs. In particular, look in the Level column for Error or Warning events. If you see any, double-click each one to read the event description. Figure 1 shows an example. Figure 1. 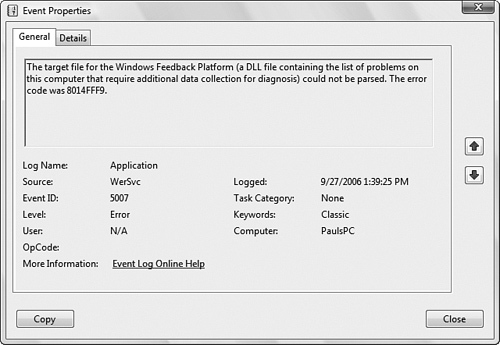 In the Event Viewer, look for Error and Warning events in the Application and System logs. Select Start, All Programs, Accessories, System Tools, System Information to launch the System Information utility. (Alternatively, press Windows Logo+R, type msinfo32, and click OK.) In the Hardware Resources branch, check the Conflicts/Sharing sub-branch for device conflicts. Also, see whether the Components\Problem Devices category lists any devices, as shown in Figure 2. Figure 2. You can use the System Information utility to look for device conflicts and problems. Improper Registry modifications can cause all kinds of mischief. If the problem occurred after editing the Registry, try restoring the changed key or setting. Ideally, if you exported a backup of the offending key, you should import the backup. If the problem started after you changed your Windows configuration, try reversing the change. Even something as seemingly innocent as activating a screensaver can cause problems, so don’t rule anything out. If you’ve made a number of recent changes and you’re not sure about everything you did, or if it would take too long to reverse all the changes individually, use System Restore to revert your system to the most recent checkpoint before you made the changes. Did Windows Vista “Spontaneously” Reboot? When certain errors occur, Windows Vista will reboot itself. This apparently random behavior is actually built into the system in the event of a system failure (also called a stop error or a blue screen of death—BSOD). By default, Windows Vista writes an error event to the system log, dumps the contents of memory into a file, and then reboots the system. So, if your system reboots, check the Event Viewer to see what happened. Select Start, Control Panel, System and Maintenance, System. Click the Advanced System Settings link and then enter your UAC credentials to open the System Properties dialog box with the Advanced tab displayed. In the Startup and Recovery group, click Settings. Figure 3 shows the Startup and Recovery dialog box that appears. Figure 3. Use the Startup and Recovery dialog box to configure how Windows Vista handles system failures. Write an Event to the System Log— Leave this check box activated to have the system failure recorded in the system log. This enables you to view the event in the Event Viewer. Automatically Restart— This is the option that, when activated, causes your system to reboot when a stop error occurs. Deactivate this check box if you want to avoid the reboot. This is useful if an error message appears briefly before Vista reboots. By disabling the automatic restart, you give yourself time to read and write down the error message. If the BSOD problem occurs during startup, your computer windows up in an endless loop: you reboot, the problem occurs, the BSOD appears, and then your computer reboots. Unfortunately, the BSOD appears only fleetingly, so you never have enough time to read (much less record) the error message. If this happens, display the Windows Boot Manager menu , press F8 to display the Advanced Boot Options menu, and then select the Disable Automatic Restart On System Failure item. This tells Vista not to reboot after the BSOD appears, so you can then write down the error message and, hopefully, successfully troubleshoot the problem. None— No debugging information is written. Small Memory Dump (64 KB)— This option writes the minimum amount of useful information that could be used to identify what caused the stop error. This 64KB file includes the stop error number and its description, the list of running device drivers, and the processor state. Kernel Memory Dump— This option writes the contents of the kernel memory to the disk. (The kernel is the Windows Vista component that manages low-level functions for processor-related activities such as scheduling and dispatching threads, handling interrupts and exceptions, and synchronizing multiple processors.) This dump includes memory allocated to the kernel, the hardware abstraction layer, and the drivers and programs used by the kernel. Unallocated memory and memory allocated to user programs are not included in the dump. This information is the most useful for troubleshooting, so I recommend using this option. Complete Memory Dump— This option writes the entire contents of RAM to the disk. Windows Vista first writes the debugging information to the paging file—Pagefile.sys in the root folder of the %SystemDrive%. When you restart the computer, Windows Vista then transfers the information to the dump file. Therefore, you must have a large enough paging file to handle the memory dump. This is particularly true for the Complete Memory Dump option, which requires the paging file to be as large as the physical RAM, plus one megabyte. The file size of the Kernel Memory Dump is typically about a third of physical RAM, although it may be as large as 800MB. If the paging file isn’t large enough to handle the dump, Vista only writes as much information as can fit into the paging file. 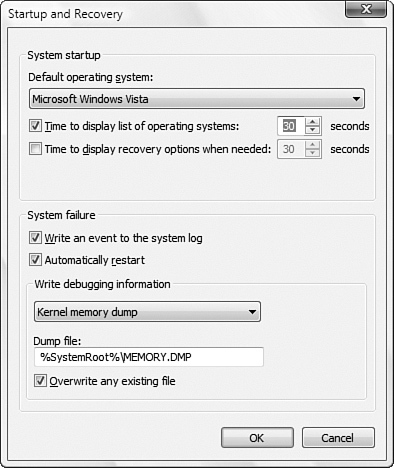 Overwrite Any Existing File— When this option is activated, Windows Vista overwrites any existing dump file with the new dump information. If you deactivate this check box, Windows Vista creates a new dump file with each system failure. Note that this option is enabled only for the Kernel Memory Dump and the Complete Memory Dump (which by default write to the same file: %SystemRoot%\Memory.dmp). Check the developer’s website to see whether an upgrade or patch is available. Run the application’s Repair option (if it has one), which is often useful for fixing corrupted or missing files. To see whether a program as a Repair option, select Start, Control Panel, Programs, Programs and Feature to display a list of your installed applications. Click the problematic application and then look for a Repair item in the task bar. If a program freezes, you won’t be able to shut it down using conventional methods. If you try, you might see a dialog box warning you that the program is not responding. If so, click End Now to force the program to close. If that doesn’t work, right-click the taskbar and then click Task Manager. When you display the Applications tab, you should see your stuck application listed, and the Status column will likely say Not responding. Click the program and then click End Task. If you suspect a new program is causing system instability, restart Windows Vista and try operating the system for a while without using the new program.If the problem doesn’t reoccur, the new program is likely the culprit. Try using the program without any other programs running. You should also examine the program’s readme file (if it has one) to look for known problems and possible workarounds. It’s also a good idea to check for a Windows Vista-compatible version of the program. Again, you can also try the program’s Repair option or you can reinstall the program. Similarly, if you recently upgraded an existing program, try uninstalling the upgrade. One common cause of program errors is having one or more program files corrupted because of bad hard disk sectors. Before you reinstall a program, run a surface check on your hard disk to identify and block off bad sectors. When a program crashes, Windows Vista displays a dialog box asking if you want to see if a solution to the problem is available. You can control the behavior of this prompt. If you recently installed a new device or if you recently updated an existing device driver, the new device or driver might be causing the problem. 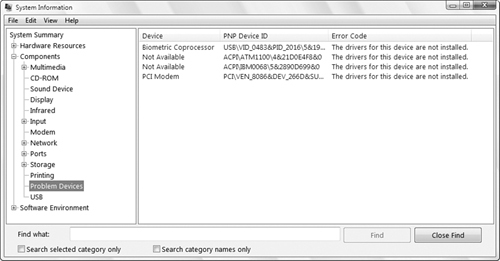 Check Device Manager to see whether there’s a problem with the device. Windows Vista allows you to install drivers that aren’t Windows Vista–certified, but it also warns you that this is a bad idea. Incompatible drivers are one of the most common sources of system instability, so whenever possible, you should uninstall the driver and install one designed for Windows Vista. If you can’t uninstall the driver, Windows Vista automatically set a system restore point before it installed the driver, so you should use that to restore the system to its previous state. Select Start, Control Panel, Programs, View Installed Updates. In the Installed Updates window, click the update you want to remove and then click Uninstall. Before you install an update from the Windows Update site, Windows Vista creates a system restore point—usually named (Install) Windows Update. If your system becomes unstable after installing the update, use System Restore to revert to the preupdate configuration. If you have Windows Vista set up to perform automatic updating, you can keep tabs on the changes made to your system by select Start, System and Maintenance, Windows Update. Click the View Update History link to see a list of the installed updates, which includes the update Name, Status (such as Successful), Type (such as Important or Optional), and Date Installed.